Using the Goverlan Reach software deployment tools, you can view and report on installed software packages on a remote machine. You can also remotely install, repair or un-install MSI and executable packages. All information and management tasks available from this feature can also be executed on a group of machines via a Process Automation. The Add New Program option allows you to remotely and silently install an MSI and executable package on a remote computer. Before you can install a software product, you must create a Software Package for it. Once a Software Package has been configured, simply select it from the Add New Program link to start its installation on the client machine. Click on the Add New Program link in the Task Panel and select Manage to open the Goverlan Objects Manager. From there, you can create, modify or remove Installation Packages. To display detailed information about a particular application, select it and click on the Properties link in the Task Panel, or, simply double-click on it. To export the information to a text file, click on the Report Information link in the Task Panel. To repair a software product, select it from the application list and click on the repair link. The Repair action re-installs the MSI package on the remote machine replacing any missing or corrupt files, links and registry keys in the process. The Repair action is only available if the software product has a valid version number and a registered product code. If any of these two pieces of information is missing, this option is disabled. 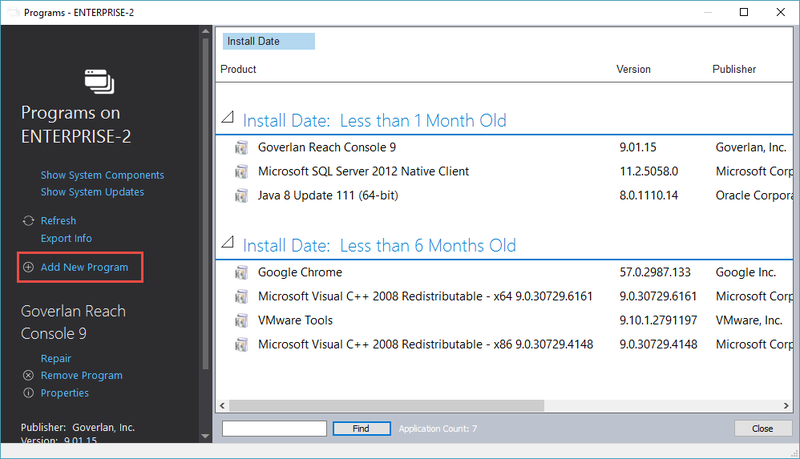 To uninstall a software product, select it from the application list and click on the Remove button. The Remove action silently un-installs the package on the remote machine, removing any files, links and registry keys owned by the software product. The Remove action is only available if the software product has a valid version number and a registered product code or a Quiet Un-install String property. If any of these properties are missing, this option is disabled. Using Goverlan, you can install, repair, upgrade or un-install MSI and executable software packages on a remote machine. Select if you want to create an installation package for an MSI or an executable. Enter the new installation package’s display name and description. Enter the full path of the installation package. 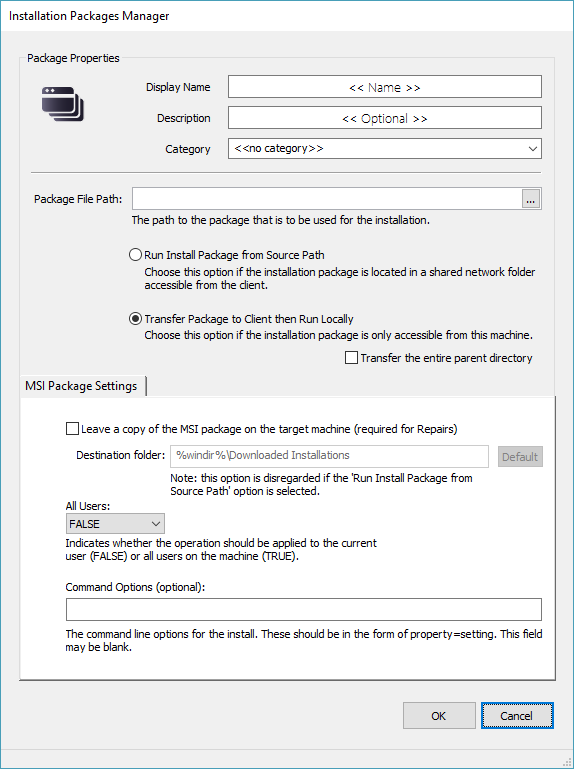 Run Install Package from Source Path – Choose this option if the installation package is located in a shared network folder accessible from the client machine. If you select this option, Goverlan will not transfer the MSI package locally on the client machine and will directly run the installation from its source location. If the MSI package being configured has external dependencies, you must select this option and the external dependencies must be located within the source folder. Transfer Package to Client then Run Locally – Choose this option to have Goverlan first transfer the MSI package onto the client machine, then run its installation from the local copy. Note: Only the specified MSI package is transferred. Therefore, it cannot have any external dependencies. Leave a copy of the MSI package – In order for the Repair MSI feature to work, you need to leave a copy of the MSI package on the remote machine. If you do not leave a copy of the MSI package, the repair feature will not work. This option has no effect if you have selected Run Instal Package from Source Path. Destination folder – The default location for where to leave MSI packages is %windir%Downloaded Installations. However, you can configure any path you wish. You can include system environment variables in the path. All Users – Select TRUE to have the MSI Package available by all users on the remote computer or FALSE to have the MSI package available only to the currently logged-in user. Command Options – Optional command line parameter to transfer to Windows Installer during the installation of the MSI package. These options are MSI specific. Argument String for Unattended Install – In order for Goverlan to install an executable package onto a client machine silently, you must configure the executable’s argument string to trigger an unattended/silent installation. Failing to set these parameters will result in an installation wizard being displayed on the client machine. Most installation executables support silent installations, however, the argument string to use depends on the vendor. Click on the Show Examples of Silent Argument String to view commonly used parameters. Click on the Ok button to save your changes. Once you have configured a software package, you can choose to share it with other Goverlan users on your network. To learn how to share or un-share an installation package, see Configuring Team Collaboration. Click the link below to submit a support ticket!